Agency19 - Marketing and Business Consulting and Development | vehicle sales techniques, selling skills, how to sell cars, sales management tools. Announcing ‘Used Car Rocket.’ Automated SEM for your Used Vehicles. Do you have a “Solution”? Stop paying for irrelevant clicks! As sales managers, what are we doing to insure our team executes? We know what our sales team SHOULD be doing, but how are we implementing a system to insure they actually perform at our levels of expectation? Leadership using math can be a fun and effective productivity tool. To help combat salesperson malaise and lack of productivity, let’s introduce a daily worksheet with a goal in mind. Our new goal will be 100 points, every day. We will assign points to activities that lead to success. Deliveries will be 5 points each. So as you can see, even if a salesperson has no vehicles sold, no appointment, and no deliveries, they can easily make 33 phone calls in one shift. Alternatively, they may have 2 deliveries, make 10 phone call, set 2 appointments, and sell 2 vehicles. It doesn’t matter to us as managers how they get there. They just need to execute. 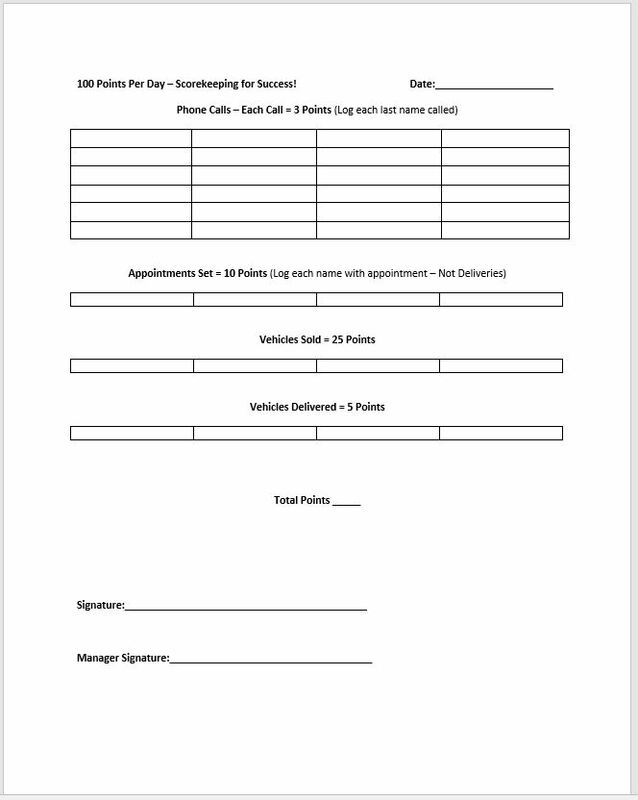 Do you think your dealership would sell more cars if they used this system? If you review the photo, you will see there is a manager and salesperson sign off. These should be review every morning for the previous day with the salesperson in our daily huddle. Your not doing a daily huddle? See tomorrow’s blog for how to execute the ultimate daily huddle. Follow us on Facebook so you don’t miss a single post.